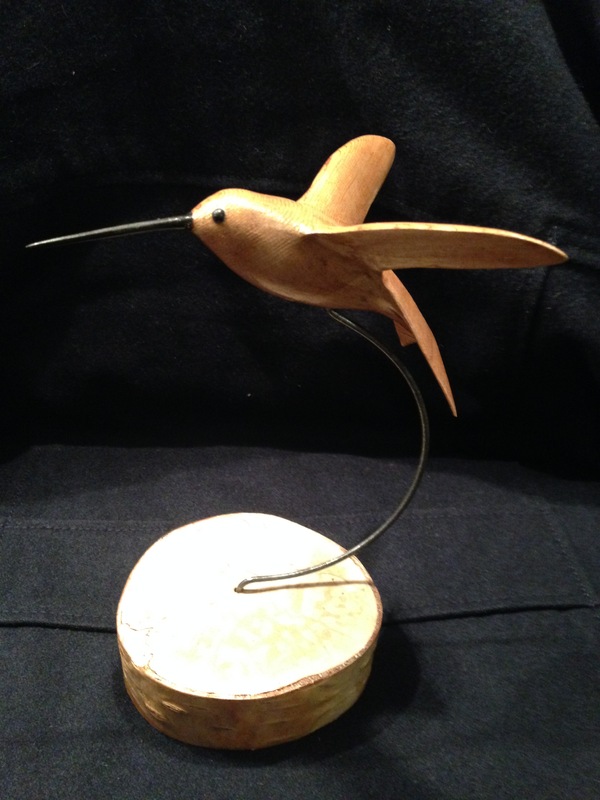 This hummingbird was carved out of red cedar, spalted birch, and ebony and is now sold. 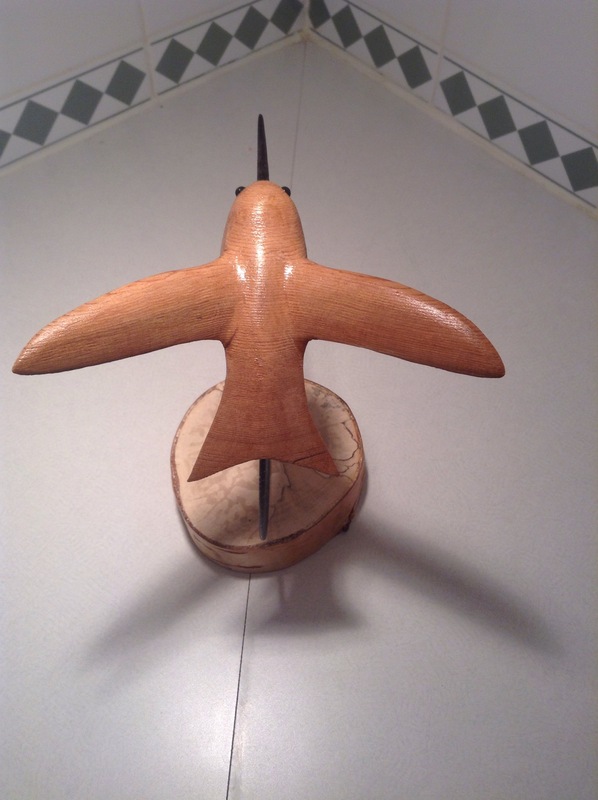 It’s unusual to carve something like this out of red cedar, especially as it is carved from a solid block of cedar. It would be easy to break, so I had to design it carefully to minimize the chances of that. The wings and tail are the most at risk, however, there are clues to strengthening them from nature. The wings and tail of the real birds are gently curved to improve flight and, I’m sure, to protect them from breaking too. 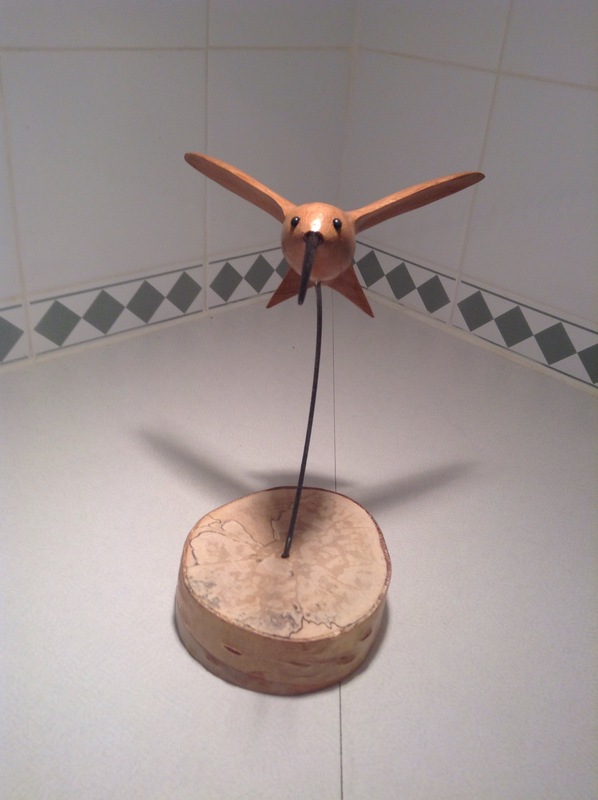 I carved similar curves and the wings and tail are surprisingly strong as a result. There are many carvings of hummingbirds out there, but if you search the internet for images of carved hummingbirds, they look similar. How many of them have their beaks tucked into a flower to hold them up? All of them? So it seems. I wanted something different, something that portrayed some motion and a sense of action. Hummingbirds have a most intriguing way of hovering and swooping in arched flight patterns, which was something I hoped to capture in the tiny sculpture. I found a piece of curved spring steel which served the purpose quite nicely. Speaking of curves, the other thing I observe in real hummingbirds is the beak is slightly curved. It was a challenge to carve the beak so thin with a very slight curve along the length of it. Sanding it with the taper and curve required extra care and attention as it was difficult to hold and very easy to break. And *newsflash* it’s very hard and dense wood – sanding it took a really long time, but I think it turned out. The base is from a piece of birch, cut by my father-in-law from their back yard, and the cedar came from a tree that my father cut years ago. I wish the ebony had a special story behind it, but I simply bought it from Windsor Plywood. The carving is finished with water-based, semi-gloss varnish, and hand-rubbed with a finishing paste wax to give it a slightly softer glow and smoother feel. It is for sale. Do you sell a pattern for this? 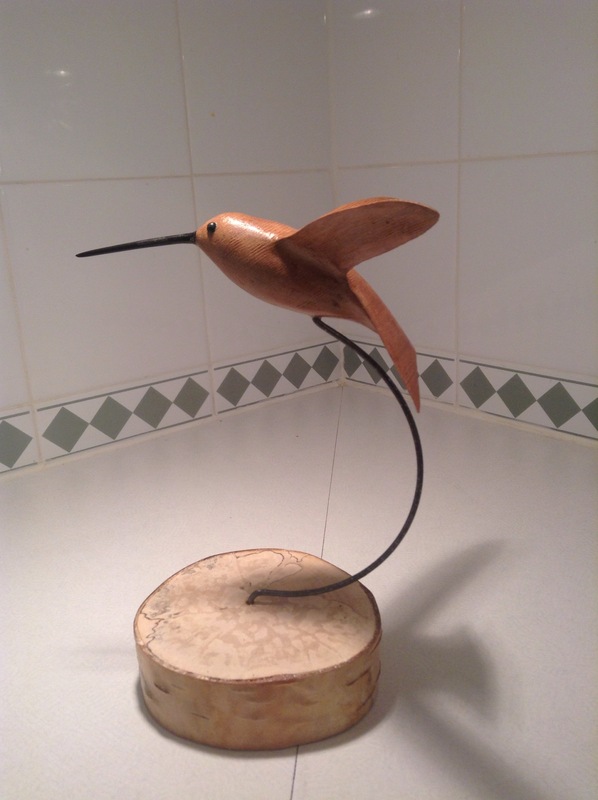 I have a friend who asked me to carve her an in the round hummingbird. Yours is beautiful. Hi Nola, I do not have a pattern. I just carved it from my own photos and observations of hummingbirds. This is pretty typical of the way I carve. Have you thought of “roughing” one out in something like plasticine? Thanks for the clarification, Pete. I really enjoyed watching you compete in the Chainsaw Carving Championships in Hope a couple of weeks ago!